This add-on is compatible with Concrete 5.5. See this incredible add-on in action! Watch the demonstration video now. 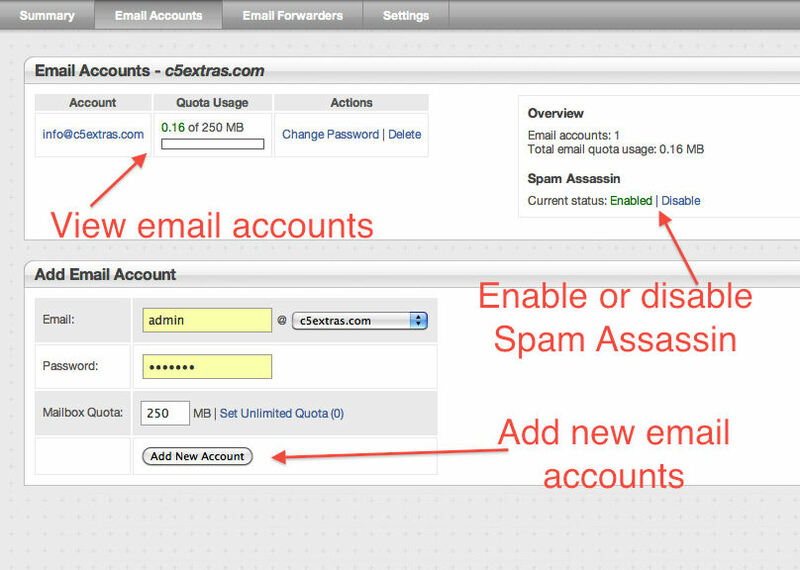 FOR WEB DEVELOPERS: Easily integrate your client's cPanel account into Concrete5 to perform simple tasks like reviewing disk usage and bandwidth usage as well as creating email accounts and email forwarders. FOR WEB HOSTS: If you're looking for a tool to automate the creation of concrete5 installs from WHM/cPanel, you can do that with this other solution over here! "This is one of the coolest add-ons I've seen." If you're a professional web developer then you already know how awesome Concrete5 is. It makes your life much easier by enabling you to build powerful websites quickly and easily. 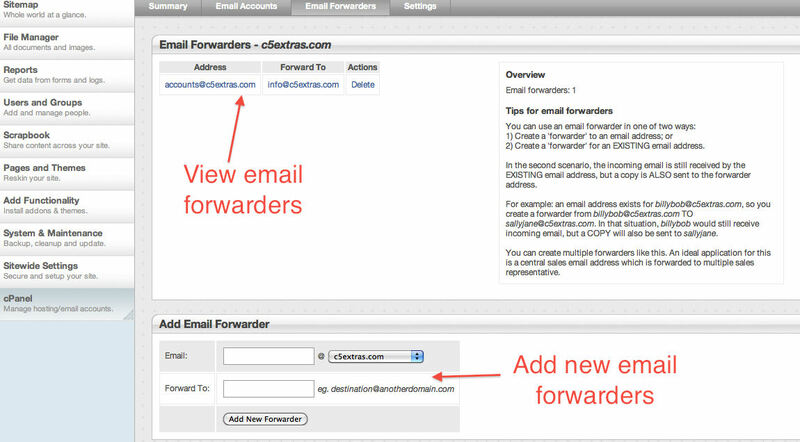 And it makes your clients lives easier by allowing them to easily manage content on their website. Everyone's happy. But, if you're like me, you often get questions from clients, particularly the technologically-challenged ones, about how cPanel works... and why they need to have 2 different logins - one for the C5 Dashboard and the other for cPanel. It's just too confusing. I know you're already visualising your technologically-challenged clients as you're reading this. Most clients just need a few basic tools from cPanel to make them happy - they don't need all the bells and whistles. Now the solution is here! Our brand new add-on which integrates important cPanel features into the existing Concrete5 Dashboard interface. And it's so easy to use, even a complete technophobe would love it. It only takes a few seconds to install and configure. And once you have it working, you can "hide" the "Settings" page using C5's built-in page permission structure so your clients can't "stuff things up". This add-on will make you much more productive, saving you valuable time and money, as well as making your clients happier. 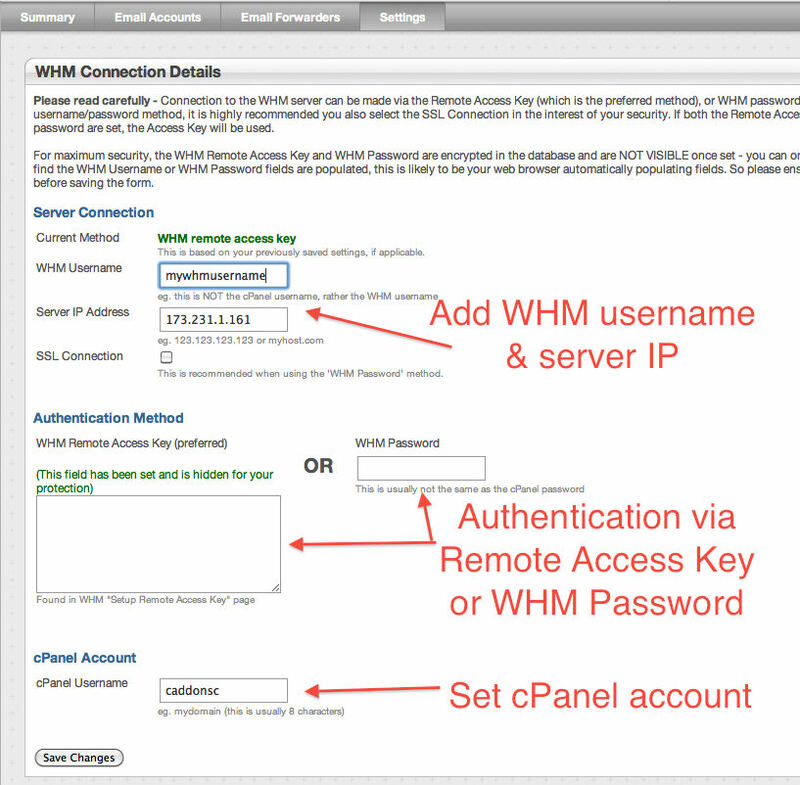 Your WHM authentication details are very important and keeping them secure is of utmost importance. 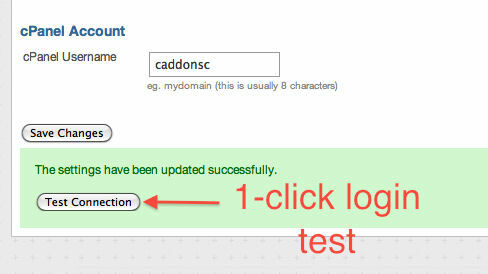 The cPanel Integration add-on has been built with this in mind. The "WHM Remote Access Key" and "WHM Password" are encrypted when stored in the Concrete5 database (using the built-in C5 encryption - PHPmcrypt). Even if your client has direct access to the database, they won't be able to retrieve these 2 important pieces of data. On the "settings" page, the "WHM Remote Access Key" and "WHM Password" are NEVER displayed - even after you have saved them. So YOU can't even see them, let alone your client. If your WHM server supports SSL, it is recommended that you select this option - particularly if you use the "WHM Password" instead of the "WHM Remote Access Key". For maximum security, it is recommended that you use the built-in C5 permission structure to prevent your client from accessing the "settings" page. This way they can't even see the page or stuff things up. Check out more of our quality Concrete5 add-ons at our website and follow us on Twitter for exclusive discounts.